Students with limited mobility are unable to access the Hive Café and other popular student spaces at the Loyola campus. The cafe, located up a flight of stairs on the second floor of the Student Centre building, has no elevator or chairlift access. The push for an accessible cafe has increased substantially, particularly after a recent audit conducted by the Concordia Student Union happened on Feb. 15, in collaboration with the Community University Research Exchange—CURE—and several volunteers. The purpose of the audit is to measure the accessibility of different areas throughout the campus, to determine where the issues lie, so that the CSU and other student organizations can advocate for solutions. “One thing that we noticed is that despite the ambitions that we have, it’s a really inaccessible campus and that’s one of the first things that has to be solved,” explained CSU Loyola Coordinator, Marcus Peters. He added that there are inaccessible classrooms on the campus, along with areas of the Central building, especially the basement. While the results of the audit have not officially been analyzed, the Hive Café stood out right away to Peters as a place that needs better access. 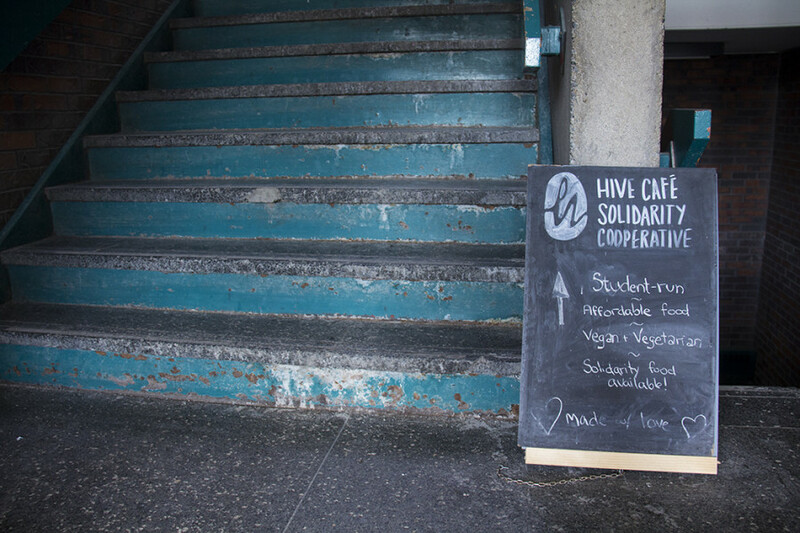 “As I’m also on the board of the Hive Café, I know that the Hive is extremely interested in pursuing these kinds of things, not only because it would be an improvement of their space but also because it would reach more students and better fulfill the mission of the Hive,” said Peters. The free lunch program that operates out of the cafe strives to provide vegan and gluten-free meals to the hundreds of students it serves every weekday. But the area itself is inaccessible to anyone with limited mobility, which Peters said is problematic. The interior of the Student Centre building, where the Hive Café is located will undergo renovations this summer, and Peters is advocating to make the building accessible. This will be challenging, since the building is already at full electrical capacity. It’s unlikely that an elevator or chairlift will be added anytime soon. Rerouting the electricity would cost millions of dollars to do, Peters said. Proposals for improvement will likely begin after Peters’ mandate ends at the CSU, but he hopes to bring up the issues to council. He would also like a mandate to be given to the CSU so that future councils are obligated to advocate for these changes. He pointed out that the CSU and CURE do not have to be the only ones working to make the space accessible—Peters hopes that other committees and associations will get on board. The audit also looked at the types of fluorescent lights used for those suffering from light sensitivity. It also took into account whether there were particularly “dull” or jarring sounds in or close to classrooms for those with hearing impairment, and whether signs on campus are clear for those with visual impairment, and the inclusion of gender-neutral restrooms. CURE conducted an accessibility audit in March of last year, but it was exclusive to the Sir George Williams campus. According to CURE Concordia co-coordinator Alex Heggie, the findings of that audit are currently being processed, and are expected to be put online by the end of this semester. CSU decided to replicate the initiative at the Loyola campus this year, using the same template that was used for CURE’s audit downtown last year and a team of volunteers.